Tavern Fenjer is located under the Brankov Bridge on the city side near Karađorđeva Street. In very short notice this part of town is synonym for night life in Belgrade. Tavern Fenjer is unique story, originally designed, implemented from begging to an end. If you would like to spend time in cozy ambient with wooden interior and plaid sheets, with wide selection of drinks and pleasant staff, tavern Fenjer that will make quiet guests to dance on tables. It's ideal for all types of people and satisfies everyone's needs. For all of you that are celebrating, mourning or partying. For those who are seeking shelter, love, music, and best entertainment, tavern Fenjer provides for its guests maximal entertainment to all delights of bohemian life. At the time being, tavern Fenjer is opened on Friday and Saturday, but it's planed to open another day. 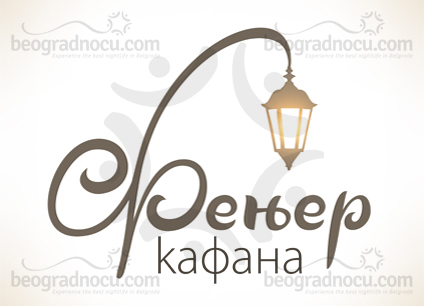 From 9 pm to sunrise ''Fenjer'' (Lantern) is raised by most popular bends in Belgrade. You can expect excellent pop and folk gigs, but also carefully selected melodious of traditional musicians, so anyone can be satisfied. One of reasons this tavern is very popular is that, you can enjoy in wide selection of drinks at very affordable prices. Regular live band performances, carefully selected music program and positive energy are one of characteristics of tavern Fenjer and what makes it different. This oasis of hedonism is a place of gathering, socializing, meeting up and moving apart, a place where you share joy and sadness with those who are not even close to us. Place that revives spirit of Belgrade, the old Belgrade, time when there weren't coffee shops, clubs, bars... Place of god entertainment and even better spirits. Place where business are done and where people enter alone and go out with 4 friends. Tavern Fenjer is your tavern, before and after! Waiters in tavern Fenjer are dressed like brother Dalton, but their names are Pera, Mika, Žika and Laza, while bartenders are dressed like sheriffs. Every night tavern Fenjer offers a prize for ''most cheerful girl'', respectively most cheerful girl gets song, drinks for her table, free free haircut and manicur from tavern Fenjer. You will recognize tavern Fenjer as your place, place you will always return to share god and bad things. Check out and see place that this is the place you were seeking for so long.